WARNING: Tacrolimus lowers the body's ability to fight an infection/disease (immunosuppression). This may increase your risk of developing an infection or certain types of cancer (e.g., skin cancer, lymphoma). To reduce the risk of these serious side effects, take this medication at the lowest effective dose as directed by your doctor. Keep all medical and laboratory appointments. Tell your doctor immediately if you develop any of the following: unusual skin changes, change in the appearance/size of moles, unusual growths/lumps, swollen glands, night sweats, unexplained weight loss, signs of infection (e.g., fever, persistent sore throat). 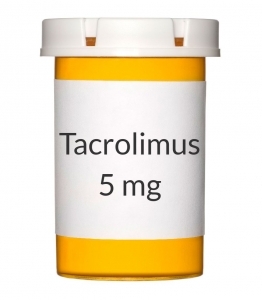 USES: Tacrolimus is used with other medications to prevent rejection of a kidney, heart, or liver transplant. This medication belongs to a class of drugs known as immunosuppressants. It works by weakening your body's defense system (immune system) to help your body accept the new organ as if it were your own. OTHER USES: This section contains uses of this drug that are not listed in the approved professional labeling for the drug but that may be prescribed by your health care professional. Use this drug for a condition that is listed in this section only if it has been so prescribed by your health care professional. This medication may also be used to treat a certain type of bowel condition (fistulizing Crohn's disease) in patients who cannot take or have not been successfully treated by the usual treatment. HOW TO USE: Take this medication by mouth with or without food, usually every 12 hours or as directed by your doctor. If you have nausea or an upset stomach, you may take this drug with food, although this may cause your body to absorb less of the drug. However, you must choose one way (with food or without food) and always take this medication the same way so that your body always absorbs the same amount of drug. Consult your doctor or pharmacist for more details. Dosage is based on your weight, medical condition, blood test results (e.g., tacrolimus trough levels), and response to therapy. Do not increase your dose or take this medication more often without your doctor's approval. Your condition will not improve any faster and the risk of serious side effects may be increased. Also, do not stop taking this medication without your doctor's approval. Take this medication regularly in order to get the most benefit from it. It is important to take all doses on time to keep the amount of medicine in your body at a constant level. Remember to take it at the same times each day. Avoid eating grapefruit or drinking grapefruit juice while being treated with this medication unless your doctor instructs you otherwise. Grapefruit can increase the amount of certain medications in your bloodstream. Consult your doctor or pharmacist for more details. Inform your doctor if your condition worsens. SIDE EFFECTS: See also Warning section. Shaking, headache, diarrhea, nausea/vomiting, upset stomach, loss of appetite, trouble sleeping, or tingling of the hands/feet may occur. If any of these effects persist or worsen, tell your doctor or pharmacist promptly. Remember that your doctor has prescribed this medication because he or she has judged that the benefit to you is greater than the risk of side effects. Many people using this medication do not have serious side effects. Tell your doctor immediately if any of these unlikely but serious side effects occur: mental/mood changes, seizures, dizziness, change in the amount of urine, tiredness/weakness, fast/pounding heartbeat, hearing problems (e.g., hearing loss, ringing in the ears), pain/redness/swelling of arms or legs, easy bruising/bleeding, muscle pain/cramp, yellowing skin/eyes, dark urine, persistent nausea/vomiting, stomach/abdominal pain, swelling ankles/feet. Seek immediate medical attention if any of these rare but very serious side effects occur: fainting, irregular heartbeat, vision changes, chest/jaw/left arm pain, black stools, vomit that looks like coffee grounds. Tacrolimus may cause your blood pressure to increase. You may be required to check your blood pressure periodically and/or take another medication to control your blood pressure. Tacrolimus may cause diabetes. Tell your doctor or pharmacist if you experience any of the following symptoms of high blood sugar: increased thirst/hunger, frequent urination. A very serious allergic reaction to this drug is rare. However, seek immediate medical attention if you notice any symptoms of a serious allergic reaction, including: rash, itching/swelling (especially of the face/tongue/throat), severe dizziness, trouble breathing. This is not a complete list of possible side effects. If you notice other effects not listed above, contact your doctor or pharmacist. In the US - Call your doctor for medical advice about side effects. You may report side effects to FDA at 1-800-FDA-1088. In Canada - Call your doctor for medical advice about side effects. You may report side effects to Health Canada at 1-866-234-2345. PRECAUTIONS: Before taking tacrolimus, tell your doctor or pharmacist if you are allergic to it; or to other macrolide medications (e.g., sirolimus, erythromycin); or if you have any other allergies. This product may contain inactive ingredients, which can cause allergic reactions or other problems. Talk to your pharmacist for more details. Before using this medication, tell your doctor or pharmacist your medical history, especially of: mineral imbalances (e.g., high potassium), kidney disease, any recent/current infections, cancer, liver disease, high blood pressure, diabetes. Tacrolimus may cause a condition that affects the heart rhythm (QT prolongation). QT prolongation can infrequently result in serious (rarely fatal) fast/irregular heartbeat and other symptoms (such as severe dizziness, fainting) that require immediate medical attention. The risk of QT prolongation may be increased if you have certain medical conditions or are taking other drugs that may affect the heart rhythm (see also Drug Interactions section). Before using tacrolimus, tell your doctor or pharmacist if you have any of the following conditions: certain heart problems (heart failure, slow heartbeat, QT prolongation in the EKG), family history of certain heart problems (QT prolongation in the EKG, sudden cardiac death). Low levels of potassium or magnesium in the blood may also increase your risk of QT prolongation. This risk may increase if you use certain drugs (such as diuretics/"water pills") or if you have conditions such as severe sweating, diarrhea, or vomiting. Talk to your doctor about using tacrolimus safely. This medication may increase your risk of developing skin cancer. Avoid prolonged sun exposure, tanning booths, and sunlamps. Use a sunscreen with a high protection factor and wear protective clothing when outdoors. Do not have immunizations/vaccinations without the consent of your doctor, and avoid contact with people who have recently received oral polio vaccine or flu vaccine inhaled through the nose. Since this medication can increase your risk of developing serious infections, wash your hands well to prevent the spread of infections. Avoid contact with people who have illnesses that may spread to others (e.g., flu, chickenpox). This drug may increase your potassium levels. Before using potassium supplements or salt substitutes containing potassium, consult your doctor or pharmacist. During pregnancy, this medication should be used only when clearly needed. Discuss the risks and benefits with your doctor. This drug passes into breast milk and the effect on a nursing infant is unknown. Discuss the risks and benefits with your doctor before breast-feeding. DRUG INTERACTIONS: See also How to Use section. Drug interactions may change how your medications work or increase your risk for serious side effects. This document does not contain all possible drug interactions. Keep a list of all the products you use (including prescription/nonprescription drugs and herbal products) and share it with your doctor and pharmacist. Do not start, stop, or change the dosage of any medicines without your doctor's approval. Some products that may interact with this drug include: aluminum/magnesium antacid, cisapride, cyclosporine, mycophenolate, natalizumab, schisandra, sirolimus, temsirolimus, ziprasidone. Many drugs besides tacrolimus may affect the heart rhythm (QT prolongation), including amiodarone, dofetilide, pimozide, procainamide, quinidine, sotalol, macrolide antibiotics (such as erythromycin), among others. Other medications can affect the removal of tacrolimus from your body, which may affect how tacrolimus works. Examples include caspofungin, cimetidine, danazol, bromocriptine, nefazodone, ethinyl estradiol, methylprednisolone, St. John's wort, azole antifungals such as itraconazole/voriconazole, calcium channel blockers such as nifedipine/verapamil, proton pump inhibitors such as omeprazole/lansoprazole, HIV protease inhibitors such as nelfinavir/ritonavir, other protease inhibitors such as boceprevir/telaprevir, rifamycins such as rifampin/rifabutin, certain anti-seizure drugs such as carbamazepine/phenobarbital/phenytoin, among others. NOTES: Laboratory and/or medical tests (e.g., potassium levels, blood sugar, tacrolimus trough level, kidney/liver function) will be performed periodically to monitor your progress or check for side effects. Consult your doctor for more details. If you have had an organ transplant, it is recommended that you attend a transplant education class or support group. Learn the signs of organ rejection such as a feeling of being ill, fever, or tenderness/pain around the transplanted organ. Tell your doctor immediately if you notice any of these signs.